Published on April 25, 2011 in Daily Dirt and Industry Activities. Closed Tags: AEM, agriculture, Association of Equipment Manufacturers, bridges, concrete, construction, construction industry, contractors, equipment, forestry, jobs, Mining, off-road equipment industry, pavement, roads, transportation, utility. A new online “job board” focused on the off-road equipment industry is now available from the Association of Equipment Manufacturers (AEM), created specifically to connect qualified job seekers with employers in the agriculture, construction, forestry, mining and utility sectors. Visit the AEM Career Center at www.aem.org for more details. Employers: post jobs for free through June 30, 2011 with code AEMJOBS11; thereafter a modest fee applies that is very competitive compared to traditional broad-based job boards. Job listings can be posted in multiple areas in the job board network to increase visibility and attract the most qualified candidates. For job seekers, the AEM job board offers free personalized “job alert” emails of new postings that match candidates’ search preferences. There are 40 job categories from A (accounting) to almost-Z (welder) and include positions in both manufacturing and service-related, office and in-the-field, private and public sector, from entry-level to executive positions, and located in the U.S., Canada and worldwide. The AEM job board includes a career resource center with an online library of helpful job-search information and links to related sites. The career resource area also features a “career coaching” option with the site’s career experts available for personalized coaching sessions, and they respond to individual questions in an “ask the experts” section. “While there have been significant job losses in the recession, there are still skilled positions available that need to be filled as our industries continue to fight back. This specialized service helps match up the companies and workers that ‘make’ America and the world,” stated Al Cervero, AEM senior vice president. Published on September 3, 2010 in Equipment & Products. Closed Tags: 764 High-Speed Dozers, construction industry, contractors, Deere, forestry, John Deere, tractors. John Deere Construction & Forestry has introduced three new series of Frontier construction offset disks for its dozers and scraper tractors with heavy weight-per-blade ratios to help users cut deep into tough, compacted soil. 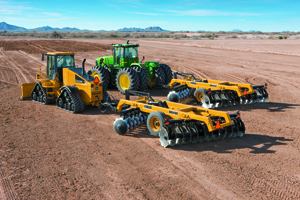 “Our customers told us about their heavy soil challenges and we’ve responded with three new series of construction offset disks that offer aggressive disking with 764 High-Speed Dozers, 750J Dozers and 9030 Series Scraper Special Tractors,” said Tom Elliott, product marketing manager for John Deere. The DH54C Series features five different widths ranging from 10 to 14 feet, and their heavy-duty steel blades feature 503 to 583 pounds of cutting force per blade to cut through soil. Standard notched disk blades are 30 inches in diameter, .5 inches thick and have 13-inch front and rear blade spacing. The DH55C Series is available in four different widths, from 10 feet to 13 feet, 9 inches. Their robust steel blades can generate as much as 639 pounds of cutting force per blade. The durable notched disk blades are .5 inches thick and 32 inches in diameter. Blade spacing is 14 inches front and rear. The Frontier DH56C Series offers four different widths ranging from 10 feet to 14 feet, 6 inches, and up to 868 pounds of cutting force per blade to tackle hard soil. Durable .5-inch-thick notched blades are 36 inches in diameter and feature 17-inch front and rear blade spacing. Each of the Frontier offset disks also feature simple gang angle adjustment that enables operators to adjust them quickly. Two separate control arms come standard; one is for transport leveling and the other is for leveling while the disk is on the ground, giving the operator the ability to select the working position for consistent cutting in each soil condition. All construction offset disks are designed with adjustable disk blade scrapers that keep blades clean for better performance and increased productivity in wet and sticky soils. The Pintle hitch swivels fore and aft, as well as side-to-side, to prevent hitch binding in rolling terrain and other harsh conditions common to job sites. Locking end washers help keep the end nut of the gang shaft tight during operation. Two gang nut wrenches are supplied with each disk to maintain torque on the gang shafts. Oil bath tapered roller bearings that are sealed with industrial-grade seals keep maintenance to a minimum and come complete with a wear plate. In addition, multipurpose transport lights come standard and function as taillights, hazard lights and turning signals. Published on May 28, 2010 in Equipment & Products and National. Closed Tags: AEM, construction, construction industry, economy, feller bunchers, forestry, heavy equipment, safety, Training manuals. The Association of Equipment Manufacturers (AEM) has revised its Feller/Buncher Safety Manual to provide machine operators and others working in forestry applications with up-to-date industry safety and maintenance information. AEM safety manuals outline common sense “do’s and don’ts” in clear language and an easy-to-follow format, and they are a convenient and cost-effective way to provide in-house safety training. Updates to the 44-page AEM feller/buncher manual include safety recommendations for slope operations and for felling trees requiring multiple cuts. Cleaning instructions are provided to avoid damage to polycarbonate glazing. The manual also discusses safety/maintenance related to machine designs involving automatic leveling of the upperstructure, severe slope operation, and bar saw felling and bunching heads. AEM’s safety and training materials cover more than 40 types of equipment used in agricultural, construction, forestry and utility applications. The association initiated its safety-tools program more than 40 years ago to provide job-proven and time-tested suggestions that promote safety-conscious attitudes and performance. In addition to accident prevention, benefits include improved worker productivity and less equipment downtime for repairs. All AEM safety manuals, videos and related safety and training products are available online at http://shop.aem.org. Some safety materials are offered in downloadable files or in DVD format. AEM members receive discounts on select materials.